It is, therefore, to the great credit of David Thacker that something less extravagant was devised for his production of Hamlet at the Octagon. This is, after all, the best known of all Shakespeare plays; is "to be or not to be? that is the question" not itself the most famous inquiry in the English language? Or can any fictitious skull be more famous than Yorick's? Hamlet is far from unique among Shakespeare plays in spawning a myriad of everyday idioms, but even so, to sit and listen to the play feels like taking a lesson in their universal reach wherever the Bard's mother tongue is spoken. Thacker's response to such familiarity was to resist the lure of ill-bred contempt. Instead, his approach was to offer a modern setting with suits and ties, military fatigues and automatic weapons. It was not, unlike some re-castings of Shakespeare, irrelevant to the central themes of the play - in this case power, family feuds and intrigue. Instead, it embraced them with more than a few overtones of 20th century political dynasties, with an iconography - encapsulated by the portrait of the king sporting his medals - that is distinctly eastern European. In this production, the hint was subtle, as it should be, and not overplayed, as it so often is. This approach was backed up by an excellent set, one that managed to fit in three balconies - for what Shakespeare play is complete without a balcony? - and a simple, focused use of space and light that was perfectly calibrated for so intimate a venue as the Octagon. It was supported by some memorable performances too, not least that of David Ricardo-Pearce in the title role, who lived and breathed the part with expectorant vigour. No less compelling was the part of Laertes, played with style and depth by Michael Peavoy, or the adept way in which Jessica Baglow depicted the gradual disintegration of Ophelia's psychological state. They were the stand-out performers in a fine cast, who performed without egregious flourish in a play not lacking in grand gestures. 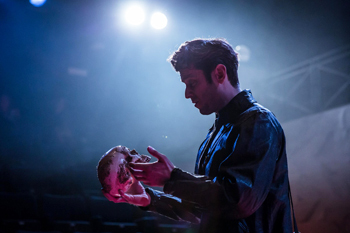 With its fast-moving script, rich language, plot twists and tragic climax, Hamlet remains a compelling tale that finds echoes in every family, no matter how great or small its dysfunctions, and poses deep questions with an almost manic nihilism - albeit one that turns out to be utterly destructive. It is pleasing to report, therefore, that this particular production of the play does ample justice to each of these aspects. 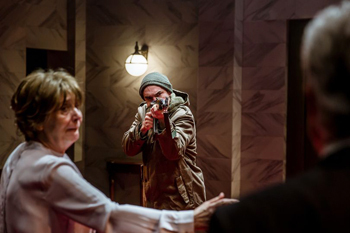 Hamlet is on at Bolton Octagon until 10th March 2018.